We can all be a little OCD about our music sometimes. We want to listen to just the right thing, and we're happy to go search through our phones or computers to find it, then connect it to our stereo, and play it. Other times, we simply want to put some music on. Something we like, and if it's not easy, we're not going to do it. 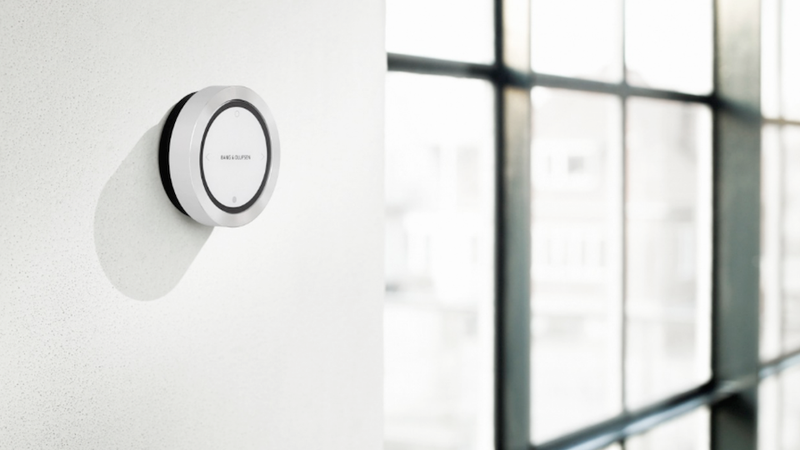 The BeoSound Essence from Bang and Olufsen is all about the second scenario. The BeoSound Essense is a two-part system. The first part is a lovely wheel-shaped controller that you attach to your wall in a convenient location (by your front door, say). This is the remote control, and its banner feature is simplicity. Want to turn your music on? Tap it. Want to skip tracks? Tap it again. You can also adjust volume and mute. And that's it. The other half of the system is a small box that attaches to your stereo will be hidden away somewhere. It's the box that connects to services like AirPlay streaming, DLNA streaming, Spotify Connect, QPlay and thousands of global internet radio stations. There's also an app called BeoMusic (for iOS and Android) which is how you configure the system to your preferences. You can also manually set a playlist, should you desire. Once you're done with the initial setup, you can pretty much just use the remote for you day-to-day music listening. You spin the metal ring to adjust volume up and down. It had a satisfying weight and while it spun easily, it had just enough resistance to keep you from accidentally blowing out your eardrums. Inside the ring is a circular D-pad. Tap up to play, tap down to pause, and tap left or right to skip tracks. The system was extremely responsive, and music played through it sounded very decent (though a longer listen would be necessary for a real evaluation). They are also coming out with the BeoLab Transmitter 1 and the BeoLab Receiver 1. This essentially allows you to convert hard-wired legacy products into a wireless system so it can be controlled by this system. One transmitter can send to up to eight receivers. The transmitter is available now and costs $525. The receivers will be released in Feburary and will run roughly $265, and you'll need one for each legacy channel you're trying to connect, of course. So you can set it to play music throughout your entire house with a single touch, but it'll cost you. The BeoSound Essence (the part you see) is a rather lovely pice of hardware. It's small enough that it would fit in the palm of your hand, but of course you'll want to wall-mount it. It's powered by AAA batteries, and B&O estimates you'll get about 1.5 years of use before you'll need to swap them out. Sounds optimistic. The control definitely looks like a high-end piece of technology, but it doesn't stand out like a piece of typical audio equipment. It looks more like a piece of minimalistic modern art. For those familiar with B&O, this isn't a surprise. They're a design-centric audio company with a focus on making good-looking stuff that's meant to be showed-off. And of course, it comes at a premium price. The BeoSound Essence carries a suggested retail of $1,000, with another $200 for each additional remote you want. Ouch.